It was thoughtful of the winter gods to give us a parting gift a week before our clocks sprang forward. That Sunday night snowfall was perfection, like a robin’s-egg blue box with a big white bow. Everyone was snug as a bug in a rug before it hit, plenty of snowplows standing by to clear the roads, school on two-hour delay, and a blank slate of pure white upon which to metaphorically write. I chose the snowy woods of Rockefeller State Park Preserve where I got to lay down the first tracks of the day. Mondays are the best for adventure, when the weekend warriors have all gone home. 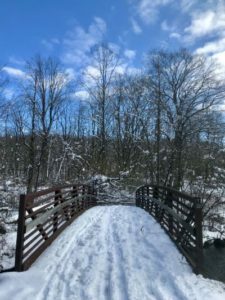 I began on the aptly named 13 Bridges Trail re-enacting Robert Frost’s “The Road Not Taken” and ended when dive-bombed by big fat snowballs falling off the trees as the sun came out. I had 1,700 acres of forest, field, and stream all to myself. This swatch of land in the Pocantico River watershed is full of rolling to steep hills running to the Hudson River. It’s all part and parcel of the former estate of John D. Rockefeller, founder of Standard Oil and the nation’s first billionaire. He collected about 3,500 acres of it over the course of seven years (1893-1900) to create his country estate, Pocantico. His descendants graciously returned and endowed the land to the State of New York so that future generations could enjoy it as they had. John D. chose the Hudson Valley at his youngest brother Bill’s behest. William Avery Rockefeller, co-founder of Standard Oil, had purchased 200 acres with an existing homestead in 1886. He encouraged his brother to do the same while land was still available. He rebuilt the house, Rockwood Hall, to be one of the largest in America, second only to the Biltmore, the Vanderbilt mansion in the Blue Ridge Mountains of North Carolina. Rockefeller’s first purchase in 1893 was 250 acres on the highest point of the Pocantico Hills overlooking the Hudson. He soon began building his Georgian manor with the help of his son, John D. Jr., who closely managed the design and construction. Completed in 1903, it was named Kykuit, the Dutch word for lookout. Father and son purchased or built more than 60 structures over the years including a 9-hole golf course, a playhouse with indoor and outdoor pools, tennis, squash and basketball courts, a billiard room, and bowling alleys for his family. But one of John D.’s proudest moments was when the family chose his landscape design for the grounds over one by Frederick Law Olmsted, designer of Central Park. This experience is what one shares today whether on foot, snowshoe, or horse. Forty-five miles of carriage trails of crushed stone lead to shady river lanes, intimate wooded paths, and panoramic vistas. All yours for the taking. The estate would eventually house four generations of Rockefellers. In addition to a son, John D. and his wife, Laura Celestia (“Cettie”) Spelman, had four daughters: Bessie, Alice, who died in infancy, Alta, and Edith, and John D. Jr. married Abby Aldrich and they had six children: Abby (Babs), John III, Nelson, Laurance, Winthrop, and David. Most lived on the property and were involved with the estate. But time marched on. After William passed away in 1922, Rockwood Hall was converted into a series of country clubs, gradually falling into disrepair. John D. Jr. acquired his uncle’s estate in 1937 and razed the house in 1941, dumping the pieces into the Hudson River as was then the custom. He spared the foundation, roads, and landscaping by Frederick Law Olmsted. The land eventually went to his son Laurance who sold a parcel to IBM to pay taxes on the rest. IBM sold to New York Life, which sold to Regeneron which is there now. The remaining parcels were sold to New York State for little money, with the last 33 acres donated in 1998 to become part of Rockefeller Preserve. After John D. Rockefeller died in 1937, Kykuit became his son’s family home. Nelson Rockefeller bequeathed his one-third interest upon his death in 1979 to the National Trust for Historic Preservation, which opened the way for preservation and public tours. Rockefeller families still live on the estate, in the central compound and beyond. The preserve consists of four sections. Swan Lake: The scenic heart. Brothers’ Path is the gateway. Buttermilk Hill: The eastern section overlooking the Sawmill River Valley (now the Sawmill Parkway, alas). Eagle Hill: The western section crisscrossed throughout by the Pocantico River and Gory Brook. Rockwood Hall: Offers grand vistas of the Hudson River and Palisades, spacious grassy fields, magnificent old Copper Beech trees and massive rock walls and terraces. 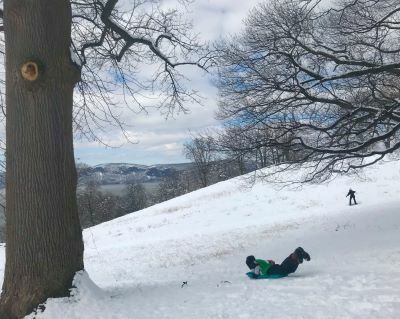 Best sledding hill in Westchester. If the woods aren’t for you, check out Union Church, a Gothic Revival built by John D. Jr. in 1921. When his wife Abby died in 1948, their son Nelson had Henri Matisse design windows in her honor. When John D. died in 1960, his children commissioned Marc Chagall to design a window for him. And don’t miss Stone Barns Center, a not-for-profit farm and education center offering a unique experience: “the opportunity to learn about agriculture firsthand on a working farm and build connections to the food we eat.” Stone Barns, the brainchild of David Rockefeller and his daughter Peggy Dulany, is another example of how the Rockefellers shared their land. Lunch at Blue Hill Café, and reconnaissance for a nice dinner at Blue Hill Restaurant.